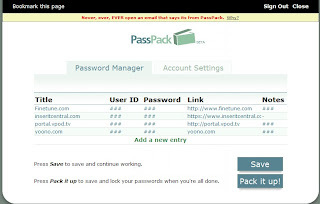 Passpack is a free online secure password manager, that lets you store your different password one site. It uses password and key two steps to access your file, that call "Double Access Technique". If you have password and without key, you still can not access your file. It use AES encryption and an SSL Secure Connection technology to protect your file. Not only store password, note and link are available. No email address required while you register.